In 2010 I bought a pair of Oakley Antix sunglasses with polarized lenses for $205. I wore the crap out of those sunglasses from 2010 – 2016. The only time I did not wear the Oakley’s was when I was playing softball. Something about wearing $200 sunglasses and playing ball doesn’t sit well with me. But on the golf course, riding my bike, driving, etc., the Oakley’s went on. Just like most things in life, at some time, it will begin to show some wear and tear. My Oakley Antix’s started to do just that in 2014. Showing some wear and tear. The Polarized lenses began to deteriorate. Little dots started showing up on the lenses. It was not a big deal at first but as time went on I started to notice them more and more as I wore the glasses. It was as if the protective layer on the lenses were starting to break down. The area of the lense that touches the frames developed a dotted ring. It was time for a replacement lense. Many many bugs ended their lives here. I went right to the replacement lense page on Oakley.com. $110 for the Polarized replacement lens. Yikes. For $90 more I could get a new set of glasses. Is what I typed into Google and Revant Optics is what popped up. I could tell as soon as I visited the website that this is what I was looking for. Not only does Revant Optics make replacement lenses for Oakley they also make them for Ray-Ban, VonZipper, Spy-Optic, and others. Find the manufacturer of your sunglasses. Select which style or frame. Choose the color. Polarized or not. All for $38 with free shipping. Much better than the $110 Oakley wanted. I went ahead and bought one of the lenses. I bought the wrong color. You have to guess when selecting the lens color and I guessed wrong. 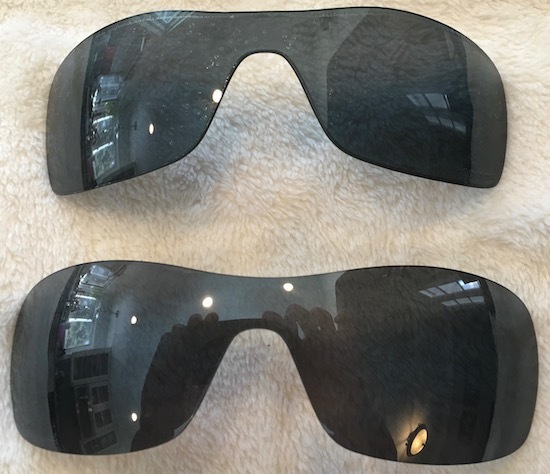 I bought the Enhanced Stealth Black Polarized lens and they were much darker then my original lens. What I needed was the Enhanced Smoke Grey Polarized lens. I returned those and had the right lens in a couple of days. I recommend buying a couple of lenses and returning the ones you don’t want. There were five lenses to choose from which all looked similar to the original ones. Its a guessing game if your lense is black or grey. Revant Optics has videos showing how to pop out the old lenses and put the new ones in. Original Oakley lens on top. Revant Optics on bottom. I bought the Revant Optics replacement lens two years ago and wore them exclusively for a year. The lens you see in the pictures above have almost two years of usage on them. There are no bug marks. No dots showing up. No scratches. As a result I can say they are a great pair of replacement lenses. The Revant Optics replacement lenses don’t have the same clarity as the original Oakley polarized lenses. Its noticeable as soon as you put them on. Probably a reason why Oakley charges $110 for replacements. I’m not one to get all into the technical side of original lenses vs replacement lenses. They are either exactly alike or not. While searching through the Revant Optics website they mention how flexible the lenses are. Oakley’s lenses do not bend at all. Seems like this may have something to do with the clarity. Oakley no longer sells the Antix frame nor do they sell replacement lenses for them. As a result, Oakley deems these frames out of style. I do not care. I am going to continue to wear them til they come back into style. There is a possibility I may make them my softball sunglasses. I bought my original lenses directly at RevantOptics.com but you may find better prices at the Revant Optics Amazon Store. Prices change all the time at Amazon but at the time of this writing I found my same replacement lenses cheaper there than on RevantOptics.com.